Marilyn SanClemente May 17, 2018 May 17, 2018 All Occasion Card, All Occasion cards, Stampin' Up! Today I am sharing another stamp set that I really like that is retiring the Garden in Bloom Stamp set. But the good news is – this card is made with the Stampin’ Up! color Flirty Flamingo which is staying! So I have found a few scraps of the Fruit Stand Designer paper left from the 2016 catalog. 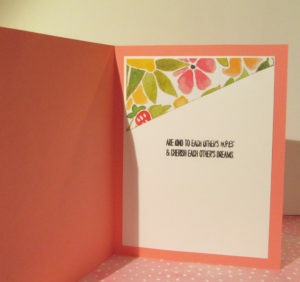 So am going to make a few of these cards with a group of ladies that I am stamping with today. I cut the DSP on a diagonal and used the other side of the DSP inside the card. Here is the inside. I love the colors and fun spring feel of this card! It is hard to see, but I used the Wink of Stella on the flower petals to give them that extra little zing. Everything needs a little bling! Both cards have a card base of Flirty Flamingo cardstock. 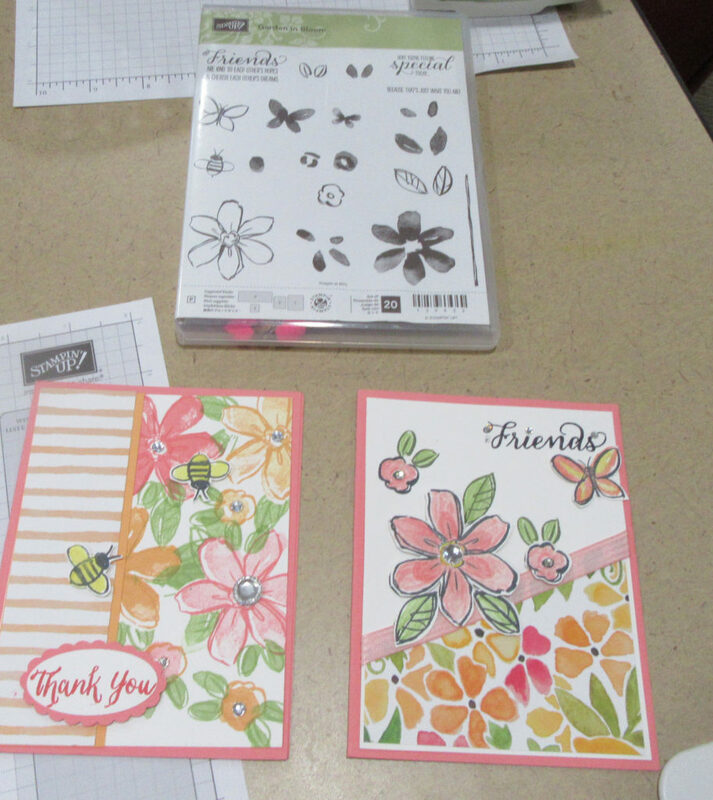 The card on the left is randomly stamped with the flowers from the Garden in Bloom stamp set. This is a great way to make your own Designer paper. 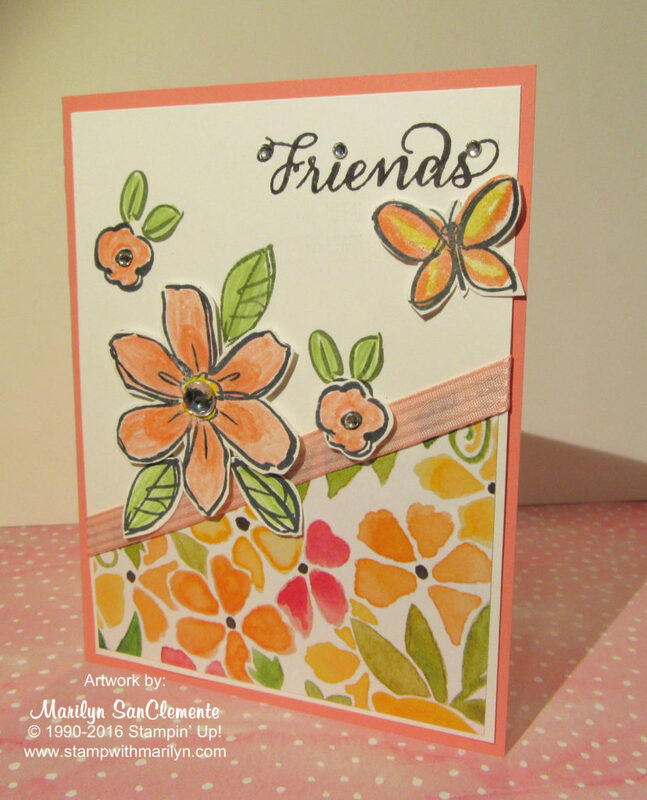 For this card I used Flirty Flamingo and Peekaboo Peach inks to stamp the flowers. The outline of the flower is stamped with the primary color and the inside of the flower is stamped with the same color and then stamped a second time on a second flower to get the lighter shade. The leaves are stamped with Wild Wasabi. Just a side note that Peekaboo Peach and Wild Wasabi inks are also retiring. For the card on the right, I used a Black Archival ink pad to stamp the outline of the flowers and then filled them in with the Flirty Flamingo ink. The flowers were cut out and applied to the card with dimensionals. The butterfly is colored with Daffodil Delight in the center. The edge of the Butterfly wings is a brush stroke of the Peekaboo Peach ink. I will miss this beautiful Cheery stamp set! Ready to place an order? If your order is under $150, then use the Host Code RY33UA2V and I will give you a sampler of the new Share What you Love Designer paper. Of course if your order is over $150, keep the Host rewards for yourself. I love to share the Host rewards with my customers!